Did you know I grew up on a hog farm? Needless to say pork was the staple food in our household, and remains my favourite protein to this day. I have loads of great ways to put this versatile meat to use, but today I wanted to share one of my best- stuffed pork loin- yum! You can stuff loin in two ways- 1. the whole loin butterflied and stuffed, or 2. individual portions stuffed. I prefer individual portions although they seem like a bit more prep, when finished there is no cutting so you don’t make a mess of the delicious insides. This method of stuffing is rather easy to do, and I promise you’ll impress your family or guests! Did you catch yesterdays post on ‘How To Use A Meat Mallet? If you didn’t you should check that post out first, to learn how to get a flat cut of meat, then you’re set to continue with this easy stuffed pork loin recipe. 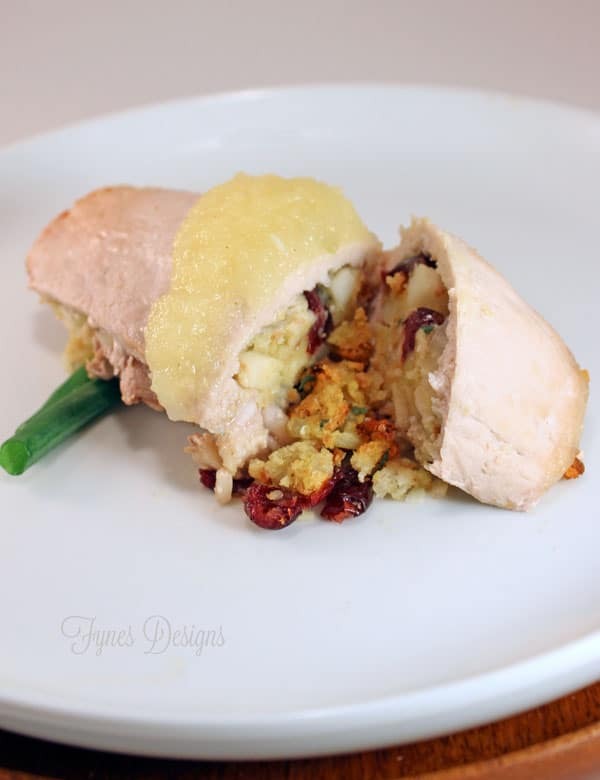 Impress guests with this easy stuffed pork loin with traditional stuffing mixture. Cook potato in the microwave until soft. Peel and mash. Lay out meat portions and add appox. ¼ of mixture on one side of the meat. 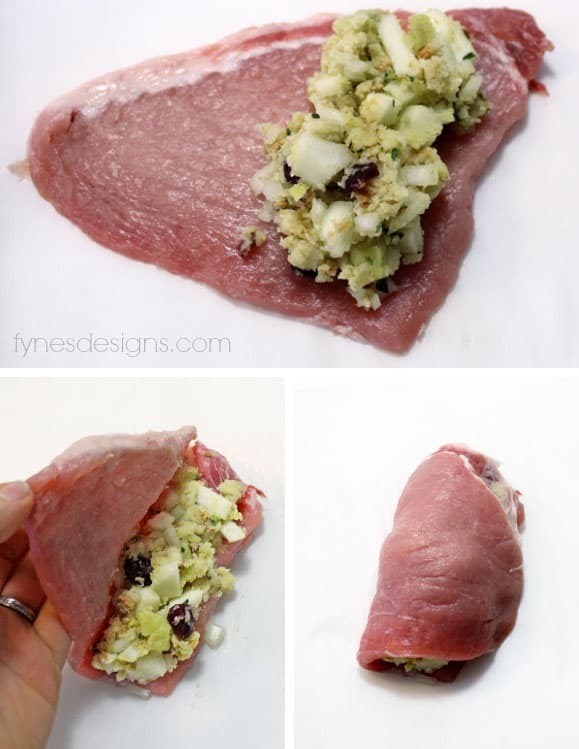 Wrap the opposite side of the meat over the stuffing, making a blanket. If desired hold closed with a toothpick, but not necessary. Place on a parchment lined pan in a 350 degree oven for 20 mins. Serve with applesauce or cranberry. If you happen to own a medium size Pampered Chef scoop, about two scoops is the perfect amount of stuffing. 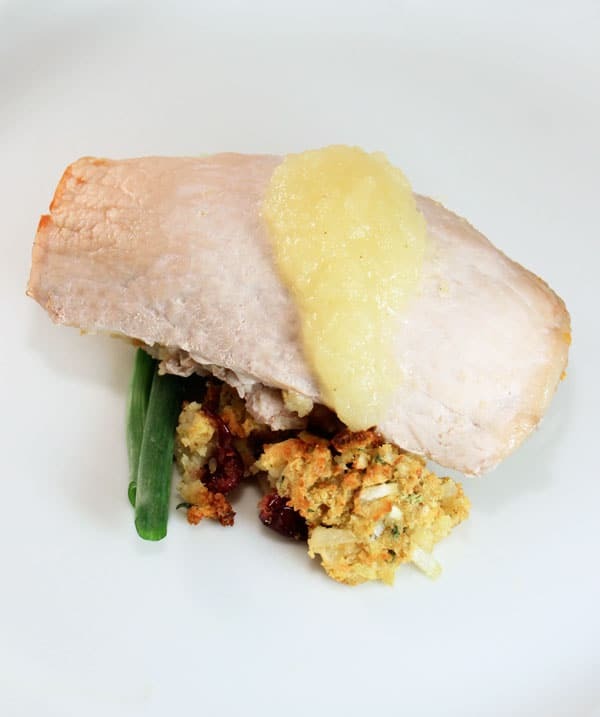 Applesauce is the perfect pairing for stuffed pork loin. Stuffed Pork Loin is a favourite in our house, what’s your best pork dish? Looking for a some great side dish ideas? Try Oven Roasted Herb Potatoes, or brown sugar rosemary squash from A Pretty Life in the Suburbs. Again check out How To Use a Meat Mallet so you can get started on this dish right away!